19-21 July, 2019. See you in Miri, Sarawak. C’QUENCE are a Latin dance band who cover a range of styles including Meringue, Flamenco, Salsa, Samba, Jazz, Pop & Rock. The band were formed in 2008 by a multicultural group of friends in Miri, Malaysia to play at a Brazilian style carnival, and have continued playing since. The band play for fun and aim to play music which is a bit different to the rest of the Miri music scene, favouring music which everyone can dance to; latin salsa king or rank amateur! Strong rythyms from Columbian conga player Pedro and Malaysian percussionist Nazruel provide the drive for the band, with foundation provided by Malaysian Bassist Rimi. Guitar and keys from Keith Robson (U.K) combine with latin sax rifts and improvisation by Greg Stone (U.K.), and finally the melodies are provided in a range of vocal styles and languages by Yadira (Venezuela) and Geja (Netherlands). 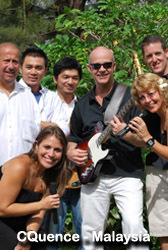 A range of nationalities and personalities results in a rich blend of musical styles, which is sure to get you dancing. © 2006-2019. Sarawak Tourism Board. All Rights Reserved. Disclaimer.